Georgia’s strict system for adding new voters to the rolls risks disenfranchising tens of thousands of minorities in the battleground state this fall, according to a new lawsuit by several voting rights groups. Since July 2013, Georgia has failed to process more than 42,000 voter registration applications because the personal information provided didn’t exactly match existing information in state-maintained databases, lawyers for the groups said. Over 86 percent of those whose applications weren’t processed were non-white, even though whites have made up nearly half of those who have sought to register during that period. The lawsuit, filed Wednesday in federal court, charges that the “exact match” system used by Georgia Secretary of State Brian Kemp violates the Voting Rights Act’s ban on racial discrimination in voting. It asks that the state be required to stop using the system immediately, while there’s still time for affected applicants to be added to the rolls. Kemp’s office says it’s following the law. 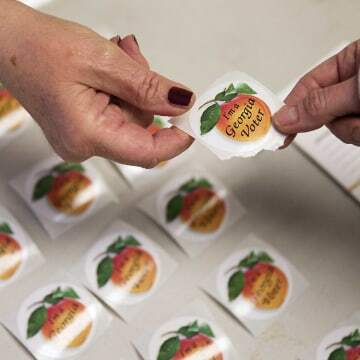 Until 2013, Georgia was among the states required to “pre-clear” any changes to its voting rules with the federal government, to ensure they didn’t harm racial minorities. Kemp instituted the system soon after taking office in 2010. But voting rights groups say that at the time the Justice Department approved it, data showing that the system disproportionately affects racial minorities didn’t exist, since the system hadn’t yet gone into effect. The controversy comes at a time when Georgia’s non-white population is soaring. Thanks to an influx of African-Americans from other parts of the U.S., as well as Hispanic and Asian immigrants, the state will be majority non-white by 2025, according to one projection made last year. The demographic changes threaten to upend Georgia’s political balance. very narrow lead over Hillary Clinton there. Could Voting Restrictions Be Trump’s Ace in the Hole? Under Georgia’s system for handling voter registration applications, even very minor discrepancies — a missing accent, hyphen, or middle initial, for instance — between the personal information provided and the information contained in the state’s motor vehicle department or Social Security Administration databases can cause an application not to be processed. A woman whose driver’s license information is under her maiden name but who registers to vote under her married name might also be tripped up. Voting rights advocates say blacks, Hispanics, and Asians are more likely to have names with the kind of unusual features that lead to discrepancies. And they say the error might not even be made by the voter, but rather by the government worker processing the application, or the one who entered the original information in the state’s motor vehicle or Social Security Administration database. “There’s a big problem here with the fundamental right to vote being dependent on the accuracy of data-entry by a government agency,” said Michelle Kanter-Cohen, a lawyer with Project Vote, which is helping to bring the case. The state does offer those who fall victim to the mismatch problem a chance to fix it. But voting rights advocates say it’s far too difficult. Applicants are notified by mail and given 40 days from when the letter was issued to fix the mismatch — otherwise their application is rejected. But for those whose applications didn’t match with Social Security Administration data, the letter they receive doesn’t tell them what the mismatch was or offer any additional information, making it potentially difficult to resolve the issue. “It is not clear how voter applicants could even begin this process without more information or guidance from the State,” the complaint alleges. Voting rights advocates also say they’re concerned that Kemp isn’t following through on assurances he gave Department of Justice when the system was approved that his office would first check any mismatches to make sure that they weren’t the result of data-entry errors, before contacting the applicant and requiring them to take another step. Kemp’s office declined to comment on the claim. This isn’t the first time that Kemp has been accused of making it harder for racial minorities to vote. national headlines when he launched a controversial probe of an organization led by a top Democratic state lawmaker that was working to register African-American voters.